To help you prepare for your interview sessions, More Than a Story has created a unique and comprehensive guide with thoughtful questions. Your guide will be personalized to include questions that pertain to your life experiences. Taking advantage of the guide helps to ensure that we capture a complete history of your life and gives you the opportunity to reﬂect and share about the lessons you learned and the experiences that shaped you. One of the most powerful and insightful chapters in your book will be the Reﬂections chapter containing the highlights of your life, your personal thoughts and reﬂections and your advice and words of wisdom to your loved ones. Your personalized guide will contain a special section with more in-depth questions to help you reﬂect and share in these areas. The most treasured last chapter in your book gives you the opportunity to thank all of those who made an impact in your life, who inﬂuenced you, supported you and encouraged you. This moving chapter ends your book with thank-yous and special words to your loved ones. 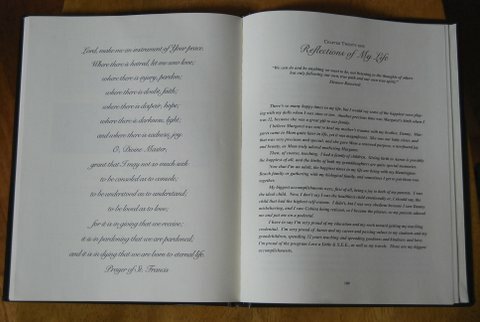 Also look at our Special Occasion books for more ideas of gifts to honor and celebrate the life of a loved one.